There are three haves and 14 have-nots this August, making it further proof that Hollywood views August as the perfect time to release anything in their library they view as embarrassing. The only real decision this month comes down to how a person ranks The Bourne Ultimatum versus Rush Hour 3. On paper, the gap between these two titles and the rest of the top ten is that dramatic. Third place is rather clearly Superbad, and the bottom falls out after that. Picking the number four film this month is like picking which of your teeth you would most enjoy being ripped out with a pair of pliers. No selection is going to be ultimately satisfying. And it only gets uglier in filling out the rest of the top ten from there. The latest release in the Bourne franchise is not going to sneak up on anyone. After the relatively quiet debut of The Bourne Identity in the summer of 2002, word-of-mouth drove the title into the stratosphere of all-time great action movies. In fact, I consider it to be the genre's best since Die Hard. 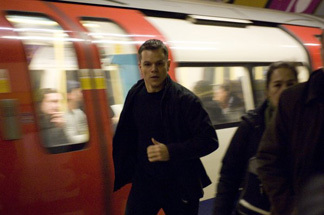 When The Bourne Supremacy was ready to makes its debut, many box office analysts questioned whether its predecessor's success on the home video market would translate into greater theatrical revenue for the sequel. An opening of twice The Bourne Identity and final box office of $176 million emphatically answered that question. At this point, the Bourne franchise has become what the James Bond franchise had been in the 20th century. It is the thinking man's action film, a delirious combination of gripping action and cerebral espionage. While there had been concerns about the storyline for The Bourne Ultimatum as recently as six months ago, early buzz and reviews are the stuff of myth and legend. The third (and possibly final) film in the franchise being hailed as the best, the satisfying conclusion to a trilogy that many argue Spider-Man, Pirates of the Caribbean and Shrek all lacked this summer. None of this matters if the marketing is lacking, of course. Fortunately, this is not a concern here. A tense trailer highlighted by Bourne ominously informing a would-be pursuer that Bourne is currently going through the personal belongings at the man's office drives home the series' underlying theme. This is a man of action who addresses opponents heads up rather than lying in wait. Audiences agree that this mano y mano action is the best thing going in cinema today, and The Bourne Ultimatum is going to be a box office juggernaut.